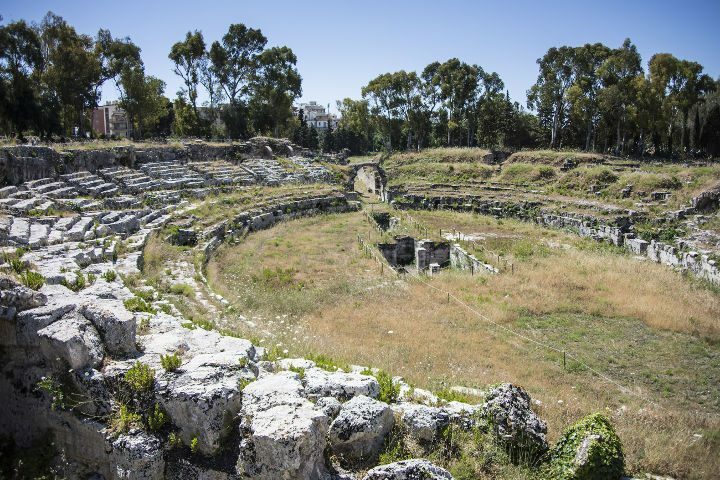 If you are looking to roll back the years to when the ancient Greeks dominated the known world, we suggest you travel to Syracuse and start your journey in the golden age of Magna Graecia. More than 2,700 years of art and history are concentrated in this extraordinary town set in the fine Sicilian landscape. 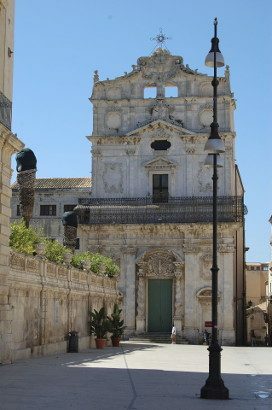 It is situated on the south-east coast of Sicily, between cape S.Panagia and the Maddalena peninsula and the city can be divided into two parts characterized by the typology and history of the buildings: the small island of Ortigia, the old part of town, and the modern city. Siracusa is listed in the UNESCO World Heritage Site as “a unique testimony to the development of Mediterranean civilization over three millennia”. Syracuse was founded by the Corinthians in 734 BC and became one of the richest and most powerful cities on the island and of the entire Greek civilization. According to Cicero it was “the greatest Greek city and the most beautiful of them all”. Syracuse was the Greek capital of Sicily (often in conflict with Agrigento and Selinunte, the two sites that still contain the largest archaeological remains in Europe) contending many firsts with Athens, as testified by its theatre and ancient vestiges that lie in a splendid natural scenery enhanced by the light and beauty of its coast. It was an era of expansion and prosperity, founding new colonies and establishing fertile agricultural settlements. Archimedes, one of the most creative personalities in history, was born here, while the philosopher Plato visited Syracuse several times. Countless conflicts between Greeks and Carthaginians as well as internal struggles between colonists and the lower classes weakened its supremacy, but when the Romans conquered the city it regained status as the most influent Sicilian towns and enjoyed a small but important period of prosperity, mainly due to trade through its port. From the Arab conquest on it slowly lost its dominant role. The south-eastern area of the island is also the Baroque capital of Sicily, another grand season in Sicilian art. 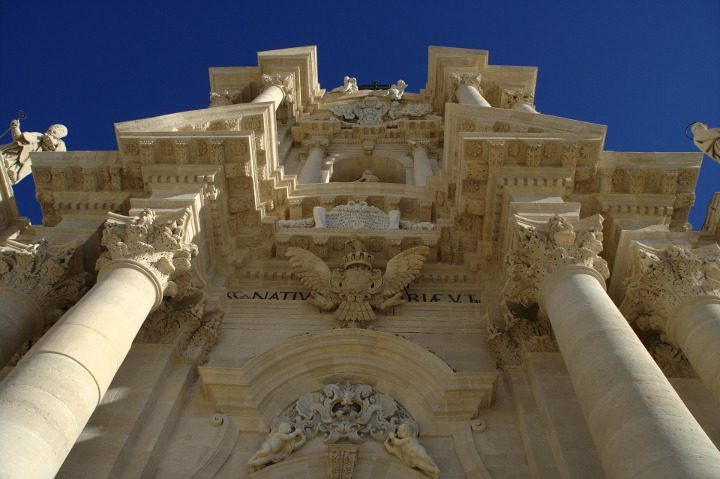 Ragusa, Noto, Modica, and Scicli, and the same Siracusa represent in the colour of the stone and architectural features, a southern twist on this impressive scenic style. Like Ragusa, it was hit by the 1693 earthquake. This event, in addition to the previous earthquake of 1542 and the plague in 1729, shaped this area considerably and left clear signs that we can still see today. 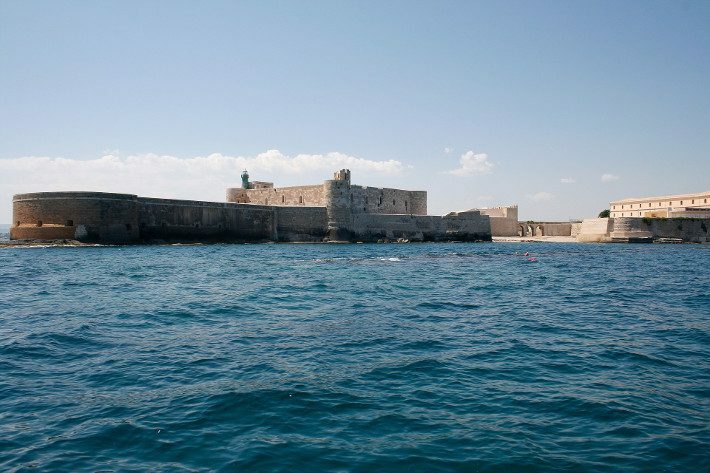 When the Greek settlers landed here in the VIII century BC, they established their colony on the small, strategically significant island of Ortigia and this became the nucleus of Syracuse. Over the centuries its buildings were influenced by the fashion of the time, not only by the ancient Greeks but also by the Romans, the Arabs and the Normans. Ortigia has undergone thoughtful renovation of its townscape creating a characteristic and vibrant island well loved by tourists visiting the sights as well as the shops selling clothing and various wares and the well-known food market, a colorful arrangement of stalls where you can taste many of the delicious things that Sicily has to offer, from fish and cheeses to fruit and vegetables. 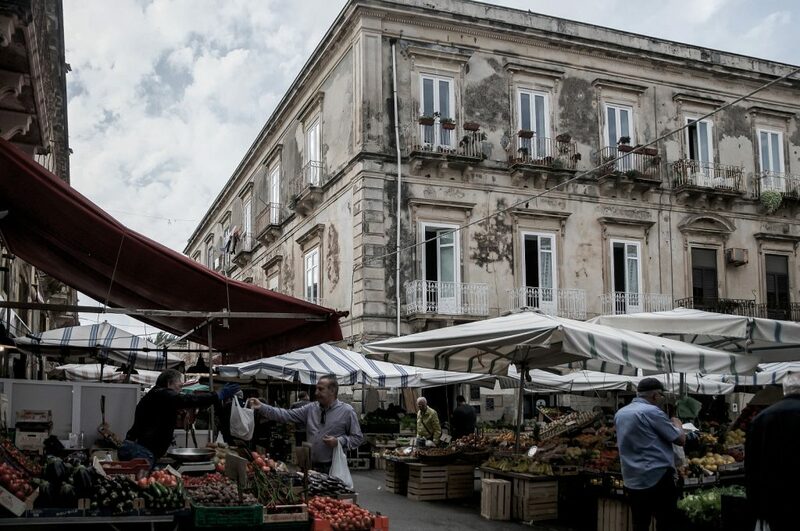 Connected to the rest of the city by three bridges, a stroll along the streets of Ortigia offers up the wonders of Baroque and Medieval buildings, some very impressive but others still in a state of abandonment and where nature has sought to reclaim its rights. A walk from the west seafront to the south of the island brings you to one of the best sights in Syracuse: the Fountain of Arethusa. It is a natural-fresh-water spring dating back to the first Greek settlement. According to mythology, the nymph Arethusa turned into a spring after she refused the advances from the god Alpheus. The myth is represented in the sculpture alongside the fountain. In the basin, you can see fish, ducks and papyrus plants that in the whole of Europe, grow only here and in Fiume Freddo near Catania. The fame of the Fountain of Arethusa has been perpetuated through the works of various artists and poets. 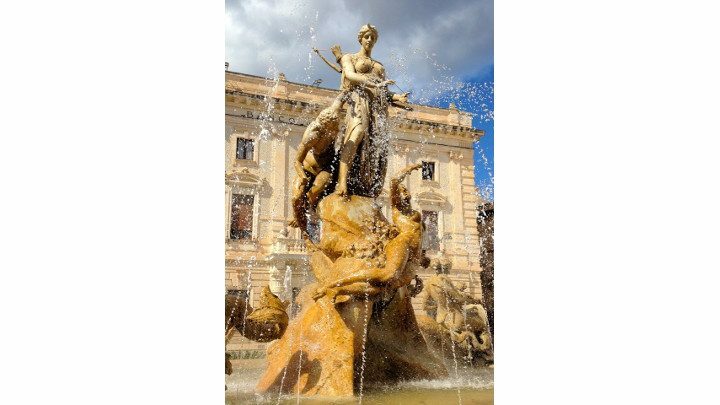 Another fountain that narrates the myth of Arethusa is the Fountain of Diana (Giulio Moschetti, 1906) located in the elegant square of Piazza Archimede. The mansions around the square bring together all the architectural styles on the island. Other important sights to see in Ortigia are the Maniace Castel and the Regional Gallery. The first was built by Frederick II of Swabia in 1239 and is famous for its entry arch covered in precious polychrome marbles; the second hosts an art gallery with paintings and sculptures from different periods. From the bridge Ponte Umbertino, you can reach the ruins of the Doric Temple of Apollo. It is the oldest Doric temple in Sicily, dating back to VI century BC. It had been subjected to various transformations over time before excavations in the mid-nineteenth-c. brought to light the remains that can be seen today. We recommend a visit to the ruins after dark, when the lighting creates a suggestive sight. The Cathedral of Syracuse is located on Ortigia in the beautiful square of Piazza del Duomo which is also the seat of the town hall. It is a complex adaptation from the 5th Century BC Temple of Minerva that started under the Byzantines and was completed in the 18th Century. The Baroque style of the “Duomo” can be admired in its façade, while the Byzantine hand can be found in the arches and the nave. The nineteen Doric columns of the original Greek temple were well-preserved in the early works of adaption, and even with its conversion into a mosque during the Arab period. The Normans made the roof of the nave and the mosaics in the apses. In the same square, there is also the church of Santa Lucia Alla Badia containing the masterpiece Burial of St. Lucia by the Baroque painter Caravaggio. St. Lucia is the city’s patron saint and twice a year on the first Sunday of May and on December 13, her feast day, she is celebrated by parading her silver statue through the streets of the city. The statue by the sculptor Pietro Rizzo incorporates three fragments of the saints ribs within its chest. Piazza del Duomo was also where the young aristocrats of the Grand Tour sojourned during their stay in Syracuse. They frequented the charming Palazzo Beneventano, an enchanting place where from the balcony they overlooked the square below. This was an opportunity reserved for the few but nowadays you can visit the palace by contacting the owners and enjoy one of the emblems of the Sicilian Late Baroque. It is a historic building bought by local nobility in 1779 who then refurbished in the Baroque and Rococo styles this palace dating from the Middle Ages that formerly housed administrative and legal authorities. Traces of this period can be found in the courtyard and in its decorative, black and white cobblestone flooring. The palace also hosts an elegant chapel and huge crystal chandeliers imported from Murano, Venice. During his visit to Syracuse, King Ferdinand I of the Kingdom of the Two Sicilies stayed in the palace; a plaque over the balcony commemorates this event. For those who want to breathe an atmosphere of mystery and holiness can tour in the Catacombs of St. John. The catacombs are parts of a complex including the Basilica of San Giovanni Evangelista and the Crypt of San Marciano and consist in an underground tour of tunnels, graves and chapels that reveal the secrets of the ancients. The large underground area contains more than 7000 graves from the early persecuted Christians. The Romans did not allow them to be buried within the city boundaries, so the Christians recycled the burial chambers used by the Greeks. Over the crypt was built the Church of Saint John at the Catacombs in the VI century AD. The Normans made it their cathedral in the XII century; the 1692 earthquake and the ensuing negligence after this event, left the Church in the state of abandonment. From the entrance located in the ruins of the Church you can reach the Crypt of Saint Marciano, who was the first Bishop of Syracuse; the Byzantine crypt has a Greek cross plan with three apses, Ionic columns and capitals, as well as frescoes such as those of the Bishop and Saint Lucia and an opus sectile floor. The structure of the Catacombs is organized in chambers and tunnels: the main chamber of the Catacombs is the Decumanus Maximus and diverges into ten secondary tunnels, named Cardines, which lead to round chambers carved out of ancient water cisterns and used by the faithful for praying. In one of the Cardines lies a singular grave with three holes, proof of the Refrigerium, an ancient Christian ceremony, a funeral banquet for the deceased to favour him to eternal life. The Adelphia Sarcophagus, one of the most important in ancient Christianity and today exhibited in the nearby Archaeological Museum Paolo Orsi, was found here. The most important element of the sarcophagus is the fine decoration in which the Jesus Christ Nativity scene is depicted and considered the most ancient of its type in the world. The essential evidence of the greatness of Magna Graecia here is in the Neapolis Archaeological Park and its main attraction, the Greek Theatre. The Neapolis was the new part of ancient Syracuse built as the town grew and today preserves several monuments, not only from the Greek period but also from the Roman Age. In addition to the other local sights, it is a part of the UNESCO World Heritage Site of "Syracuse and the Rock Necropolis of Pantalica". The Park is divided into three parts; the first area where you can start the visit is the Roman Amphitheatre, the ruins of the typical Roman arena where gladiatorial contests took place. Unfortunately, in the XVI century during the Spanish reign the upper section made of stone was dismantled to use in Ortigia, so today you will see parts of the tribunes and the elliptical arena. In the centre of the amphitheatre, there is a rectangular room probably used to equip the gladiators during the contests. In the summer, the theatre hosts various theatrical production and musicals. Contrary to the Roman Amphitheatre, the Greek Theatre stands in very good condition and appears almost as when it was built in the V century BC. It is one of the largest theatres in the world (138 meters/455 feet) and can hold up to 15,000 spectators; the Greeks used it for various forms of entertainment: plays, tragedies and circus performances. 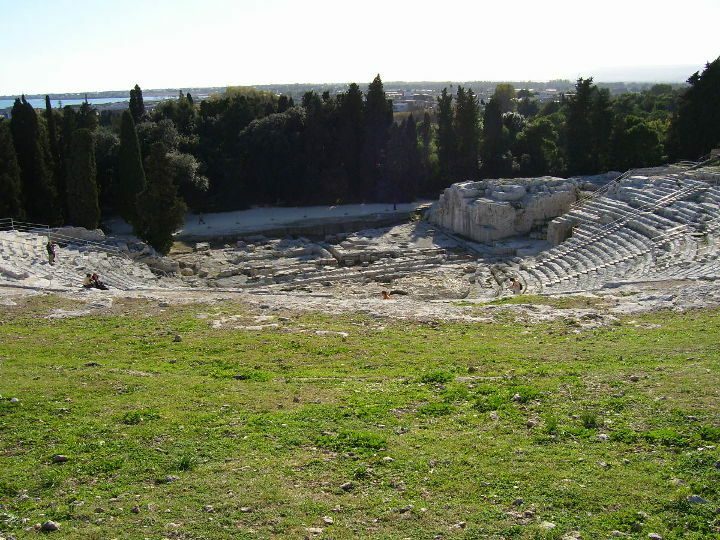 The position of the Theatre is magnificent: sitting in the tribunes you can admire the landscape over Syracuse and the Mediterranean Sea. The structure is almost entirely carved in stone and consists of three parts: the Koilon (cavea) of semicircular shape divided in nine sectors, the Orchestra located at the foot of the cavea and the vast area of the Scene with two pillars on the sides. Today the Greek tragedies are revived in the annual Festival held from May to June, a wonderful opportunity for the enthusiasts of this art. The last main area of the Neapolis is called the Latomia del Paradiso, numerous ancient limestone quarries filled with evergreen orange and lemon trees. 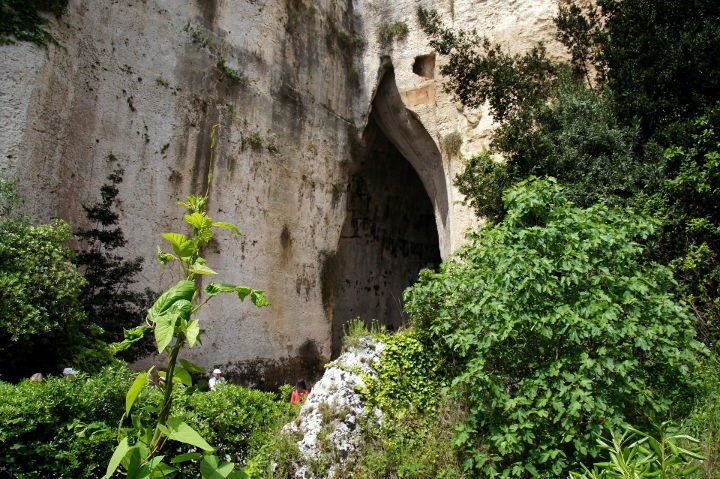 The path will lead you to what Caravaggio called “the Ear of Dionysius” because of its conformation similar to a human ear and for its particular acoustic effects: in fact, if you stand at the opening of this stone cave you can hear those who whisper at the other end. Legend has it that Dionysius incarcerated his prisoners here and spied on them through the acoustics. In the Neapolis area, there are other treasures to discover, like the presumed tomb of Archimedes. If you want to discover them all, and it can be done in about two hours, we highly recommend a visit, open every day from 8.30am to 6.45pm.